Bearded dragons are generally docile, and their aggressive displays are rarely seen in captivity. It is reported that even wild bearded dragons will sometimes allow themselves to be picked up without a struggle. 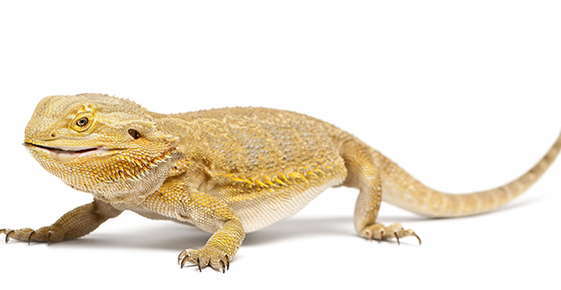 Popular as pets, bearded dragons or "beardies" are moderately sized lizards native to Australia. They are not inexpensive to care for as they have, like many other lizards, strict nutritional and environmental requirements that need to be met for them to thrive. With an adult size of 18-24 inches (reached by about 2 years of age), a good sized tank/cage will be required. The expected life span of a bearded dragon is anywhere from 4-10 years, although with good attention to nutrition and the ideal environment, the high end of that range should be expected. However, they are social and easy to tame and handle, and show a range of fascinating behaviors that make them interesting to watch. In the wild, bearded dragons are omnivores, eating a mixture of invertebrate and vertebrate prey as well as plan material. In captivity, they should be fed primarily an insect diet, primarily crickets, with a variety of other cultured insect prey. They are prone to impaction of their digestive system, and the chitinous exoskeletons of insect prey can cause problems. This is especially true of crunchy bugs like mealworms - so it is best to feed these in limited quantities. Feeding insects right after a molt will help reduce the chance of an impaction as the exoskeletons are not as tough. Crickets also should not be too large, especially for baby bearded dragons (a rule of thumb: no larger than 1/3 the size of the dragon's head, and no longer that the distance between its eyes). Pinkie mice are also an acceptable food item for adults, and do not pose the problems with impaction that insects do. Insects should be gut loaded (fed nutritious food that is then passed on to the lizard) prior to feeding, and lightly dusted with a calcium supplement (with no phosphorus), and with a multivitamin about once a week. In addition, they should be fed a mixture of green leafy vegetables, orange fleshed squash, carrots, other vegetables, and some fruits. The plant portion of the diet should be about 20-30% of the diet. Feed in a shallow bowl, although leafy vegetables can be clipped to the cage furnishings for snacking. Typically, they should be feed daily (more frequently as babies), and given as many insects as they will eat in 5-10 minutes. Veggies can be left in the cage all the time (changed daily, of course). Commercial diets are becoming available - but so far the long term success of these diets is not well known. I feel that feeding a varied diet is preferable, so if these diets are used they should probably not be the sole source of nutrition. One caution: do not feed fireflies (lightning bugs) as these are believed to be highly toxic to bearded dragons! If any wild caught insects are used beware of pesticide contamination. Water should be provided in a shallow dish, such as a shallow jar lid. Misting is also advisable as dragons are designed to get their moisture primarily from their food and licking dew drops. However, do not mist too much as to make the environment wet or humid. Bearded dragons come from dry, arid areas, and are semi-arboreal, often observed climbing on rocks and branches. Therefore, a cage should be set up with a dry substrate, hiding areas (at each end of the temperature gradient, and rocks and branches to climb on. The branches and rocks should be securely placed so that neither they nor the dragon falls while climbing on them. Many people use sand (washed play sand, not silica sand) as a substrate, although some use paper towels, indoor/outdoor or reptile carpet, or paper. Avoid corn cob or walnut shells as substrate.If sand is used, feces can be scooped out daily, but the cage will still need a good cleaning/disinfecting several times a year. Many owners construct their own cages from wood and welded wire, which is acceptable especially as it often allows more room for the dragons. For a single bearded dragon a bare minimum of a 40 gallon tank will be necessary, but bigger is better. A secure lid will also be necessary. Cage temperatures are also extremely important. A temperature gradient should be provided, as well as a basking spot at significantly higher temperatures. The gradient should be provided end to end and also vertically (by arranging a basking spot on a branch or rock off the bottom of the cage). The lower end of the gradient should be about 76 F (24 C), and the higher end 86 F (30 C) , with a basking temperature of 90-100 F (32-38 C) . Heat should be provided via an incandescent light or ceramic heater (make sure a ceramic socket is used) - experimentation with wattage and distance from the cage can be used to provide appropriate temperatures. Place thermometers in the cage (at either end and where the lizards bask) to monitor the temperatures - do not rely on estimating temperatures! Night time temperatures can fall to approximately 70 F (21 C). If needed, supplemental heat can be provided using an under the tank heating pad or heating strips. This may be necessary at night if the room temperature is very low. Avoid heating overnight with a light, as a consistent light-dark cycle (12 - 14 hours light) must be provided. Using the lights on a timer is the best way to ensure a consistent cycle. Bearded dragons are generally docile, and can be easily handled with minimal socialization or effort into taming. It is important to scoop them up under the belly and support their belly in the palm of your hand with your fingers gently curled over the body. Their nails do get sharp, and should be trimmed regularly. They can be trimmed in a similar fashion to iguana claws.